New research from Drexel University’s College of Engineering might show the ideal surface texture for helping cancer-fighting nanoparticles stay in the bloodstream. Hao Cheng, an assistant professor at Drexel’s Department of Materials Science and Engineering, led the research to find out how best to keep nanoparticles in the body for longer periods of time. Nanoparticles are being used in medicine to travel through the bloodstream with the purpose of finding and penetrating cancerous tumors. These nanoparticles have shown potential in being able to find and treat tumors, but they cannot survive in the bloodstream for very long. “Most synthetic nanoparticles are quickly cleared in the bloodstream before reaching tumors. Short blood circulation time is one of the major barriers for nanoparticles in cancer therapy and some other biomedical applications,” Cheng said to DrexelNow. The new research shows that surface topography might be essential in figuring out how to keep nanoparticles in the bloodstream. Nanoparticles are tagged with proteins once they enter the body so that the immune system recognizes them as foreign bodies and removes them. 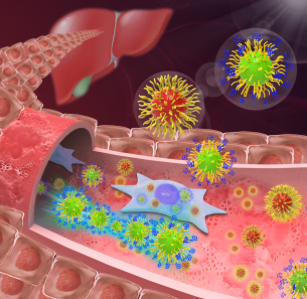 Previously, scientists believed that macrophages held the main responsibility of removing foreign bodies from blood, but Cheng’s research shows that liver sinusoidal endothelial cells are also important to removing nanoparticles. In order for nanoparticles to stay in the bloodstream, they must be protected from both macrophages and liver sinusoidal endothelial cells. Cheng and other researchers at Drexel found that coating the nanoparticle with two different layers creates a barrier to protect nanoparticles from being targeted for removal. These two layers are created using polyethylene glycol, a polymer used to coat nanoparticles. One layer, which is dense and brush-like, can repel proteins while another layer, made by grafting PEG and creating a mushroom like shape, can prevent protein absorption. “Our hierarchal bi-layer approach is a clever way to combine the advantages of both the brush configuration, as well as low-density PEG layers that form mushrooms,” Christopher Li, a professor in the College of Engineering and co-author of the paper, told DrexelNow. This two layer approach allowed nanoparticles to stay in the bloodstream for up to 24 hours, which is double the amount of time previously.